Air Angel helps cleans areas not just in the home. You can take it with you. Enter to win one today. 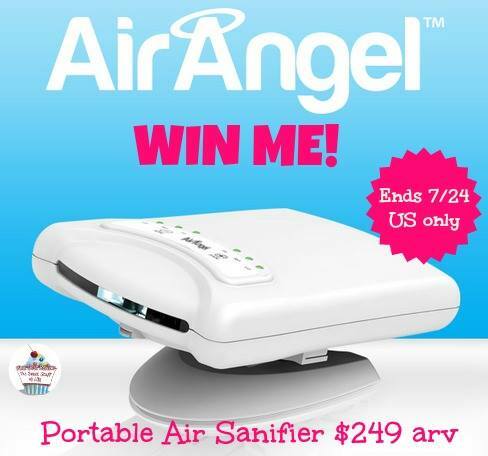 This year, Air Oasis is proud to unveil the Air Angel™, a small mobile Air Sanifier with revolutionary, energy-efficient technology that fights germs by cleaning and sanitizing the air in rooms up to 250 square feet, including nurseries, bedrooms, pet rooms, playrooms, hotel rooms, cars, planes, and more. Air Oasis has created the Air Angel just for families with children and/or pets to protect rooms from germs, viruses, aeroallergens, and harmful pollutants in the air and on surfaces. Simple Operation: The Air Angel Air Sanifier has 3 output settings, and 3 fan speed settings, leaving you in control of your air. Be sure to read Mom Does Reviews full review HERE. Find out how well it really works! One lucky reader will win their own Air Angel by Air Oasis! $249 arv! I’d use this in my bedroom! Thanks for the chance! We would put this in our living room! I’d use it in my son’s room. I figure he needs it more than I do. I would probably put this in our living room! I would definitely use it in the family room. It’s where we spend most of our time, including the pets. I would use it in the bedroom because my dog and I sleep in there and the air gets stale. I would use it in the living room because it is the biggest room and most used room. This would be a great addition to my bedroom. Both my husband and I often wake up stuffy and with a headache due to allergens and probably dust in the air. I think we’d get better sleep with this and wake up clearer. I would put this in my kids room we have an older home and they both have seasonal allergies. I would put this in the living room as this is the room that we spend most of our time in. I would use this in my bedroom as I have such severe allergies to dust and other items that I have difficulty breathing at night. I would use it in my den since I spend a lot of time in here. I love it. I would love to give this a try. I would use this in our bedroom. Clean air for sleeping is a must for a good night’s rest. I would probably use it in the living room. That is where we congregate the most; therefore, the place the air needs purified. I would use the Air Angel in the living room. That’s the room that is the hardest to keep fresh smelling. I would use it in the living room where the dogs stay a lot of the time. I would use the Air Angel in the room where I sleep. It would be nice to avoid all the odors, the smell of smoke, and people spraying perfume. In the living room with the dogs. I would put this in my mom’s room because she gets sick very easily and is often in resting in bed. We spend the most time in the living room so it would go in there! I would take this into the office with me. Fingers crossed. I would use it in my kids’ bedroom. In the living room the most. I will use it in my sons room because he has asthma. I have never heard of an “Air Angel Sanifier”! It looks good. Nice and small. And, by reading the comments, it looks like it does a great job of sanitizing the air! Something I could definitely use! I would use it in my basement. I would use this most in the room where I keep my cats’ litter boxes. I would mainly use it in the living room. I would use this in my bedroom. Where ever I am that’s where the animals are and this would help to clear out the pet dander. I would use it in the family room, which is the most used room on the house. My youngest son has asthma and this would be perfect in his bedroom! I want it in my bedroom to make it easier to breathe at night. I would use this for the living room. My bedroom is where I would use it. that would be the living room…. I would use it in my son’s room the most. He suffers from sever seasonal and environmental allergies. I would use this in the family room where the dogs spend the most time with us! I would use this in my bedroom the most. We spend most time in the bedroom, and I have been wanting to improve the air in our room. I had never heard of a sanifer before. Very cool. I would use this in my master bedroom.